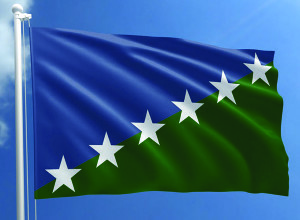 One of the finalists for the City of Burlington’s new flag. There are six other options, and the city is asking the public to vote on their favorite. Public voting began this week for the City of Burlington’s new flag. A committee of community volunteers selected seven finalists for voting from about 140 submitted designs. Voting will continue through Nov. 17 with an announcement on the winner planned for Nov. 20. The flag will be unveiled at City Hall during First Night celebrations Dec. 31.
burlingtoncityarts.org/btvflagvote and is open to anyone who lives, works, goes to school or owns a business in Burlington. Submissions were made anonymously and reviewed by a seven-person committee. The committee included Ted Kaye, author of “Good Flag Bad Flag;” Jeff Harkness of Hark website design; Megan Charles, a senior at Champlain College; Lila Woodard, a sophomore at Burlington High School; Paula Willoquet Marcondi, dean of creative media at Champlain College; city councilor Richard Dean; and resident Joyce Sheely.